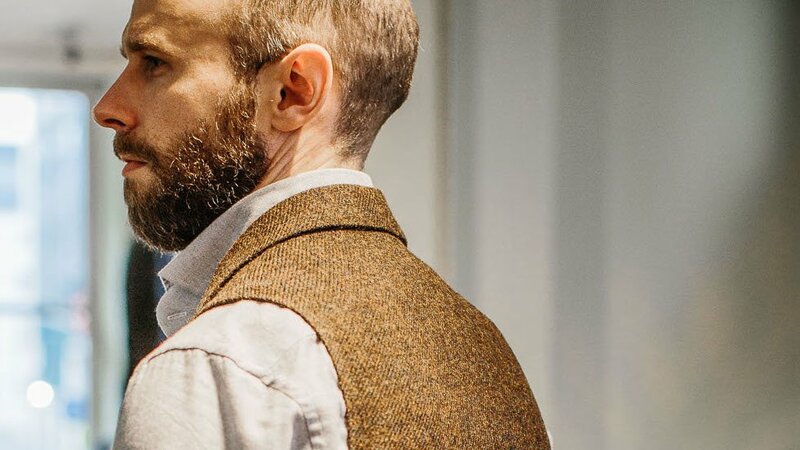 Although we discussed last week that the fit of a jacket is the most important - and flattering - part of tailoring, a waistcoat is in some ways the most satisfying. Of all the tailored garments, it is the one that sits closest to the body, and there is something peculiarly pleasing about its precision. The line formed by the armhole as it runs up and over the shoulder is particularly beautiful, and a clear illustration of the tailor's art. No ready-to-wear waistcoat will ever fit like this. 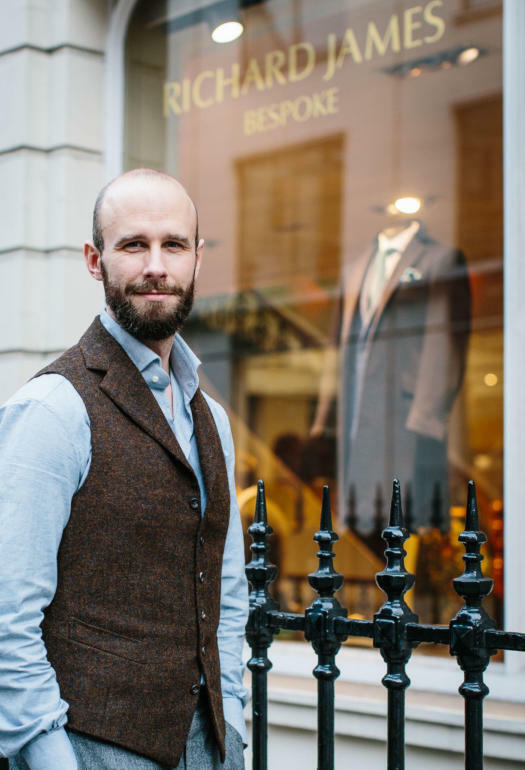 This Harris Tweed waistcoat was cut by Ben Clarke of Richard James. I reported last year on starting three separate pieces with Ben (jacket, trousers and waistcoat) following a meeting and an interest in his openness to new ideas. One big thing that helps here is Ben can and does make many of these things himself, as well as cutting them. 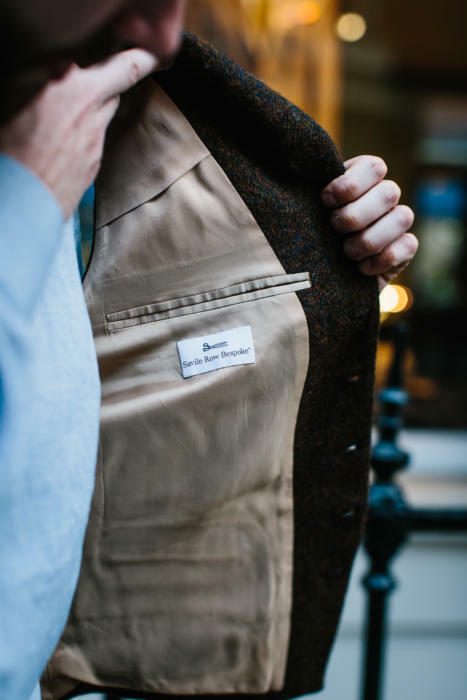 In our combination he made the jacket, with the waistcoat and trousers being made by other Richard James tailors. Although Richard James has a clear house style, as projected through its ready-to-wear, advertising and shows, I would encourage readers that like the look of any of these three pieces (as I feature them) to consider Ben for other, particularly creative projects. Ours have certainly worked out very well. Readers may recognise the tweed from my Caliendo jacket - as I wrote on Friday, probably one of my favourite pieces of all time. 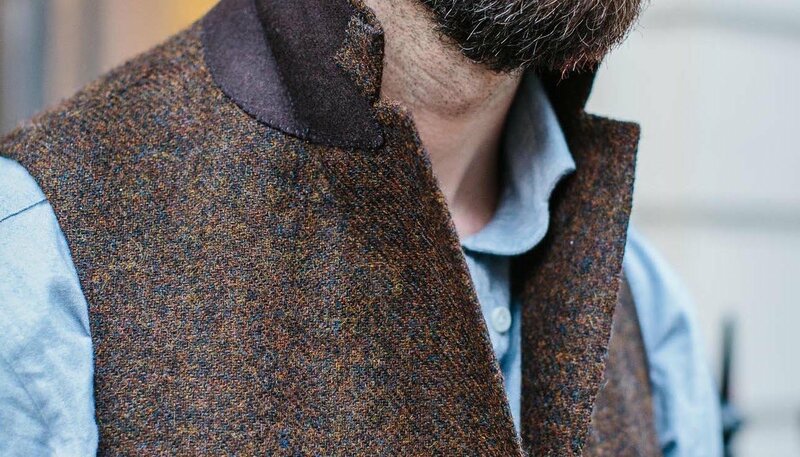 We used the modern version of that tweed from Holland & Sherry to make this waistcoat, with the idea that its texture and colour would enable it to be worn with the most casual of trousers, including denim and chinos. The style was also one I have used in the past (for example my Chittleborough & Morgan suit), with a jacket-style collar and self back. The style makes the waistcoat feel more like a jacket, rather than an odd part of a suit. It also means the collar can be popped up - something that is particularly practical on a cold day under a coat. Indeed, a piece like this is at its most useful when it becomes a layering piece under a coat or casual jacket. Waistcoats that were more workwear than dresswear used to commonly have this construction, for the same practical reasons. Vintage-inspired pieces from the likes of Universal Works or Nigel Cabourn still do for that reason. The waistcoat was cut longer in the back to enable it to be worn with those lower-waisted trousers. This is a delicate balance, of course, as if the waistcoat becomes too long the proportions of the whole piece will be thrown off. It will also start to kick out over the seat. I think we got the balance right here - it is about an inch longer than my waistcoats cut for a three-piece suit (and longer still than waistcoats cut for high, brace-backed trousers). The shirt is a blue/grey brushed-cotton oxford cloth made by Simone Abbarchi. You can follow the discussion on Harris Tweed waistcoat, Richard James by entering your email address in the box below. You will then receive an email every time a new comment is added. These will also contain a link to a page where you can stop the alerts, and remove all of your related data from the site. Thanks for this article ! I ordered a jacket with the same fabric because of / thanks to you. This quality of fit coupled with the cloth from your GB herringbone would, in my eyes, take it straight to the top of the leader board. Waistcoats are a wonderful thing. I really like the jacket collar style on this one. Did I get you right, you won’t wear it under a sports jacket because two collars on top of each other might look bulky? Is that the reason why your waistcoat by C&M has lapels, but no collar? If you were to wear it with jeans or chinos, how would you hold those up? I like the idea but I don’t particularly like a belt bulging under a waistcoat and ruining the line, and I have yet to see off-the-rack jeans or chinos with side adjusters. But just suppose you were a man who wears his chinos with a belt all the time. Would you have the waistcoat cut wider? And doesn´t it need a slightly wider cut anyway to fit comfortably when sitting down, since you don`t unbutton it like a jacket? I was going to submit this for your article on jacket fit and the previous one about Neapolitan tailoring but it is also pertinent to this waistcoat. The fit may be very important but to me so is the choice of cloth, the tweed in this waistcoat (and your Caliendo jacket) is wonderful. The idea of the cloth back rather than the silk of a “traditional” suit waistcoat makes this a very appealing garment to have. I wouldn’t have thought of having one before (the appearance of a folk singer trying to look ‘hip’ came to mind) but I am certainly considering getting one now. Particularly useful under a coat I imagine but adds a bit of style that a piece of knitwear maybe cannot achieve. I hate to appear vulgar but can you give us an idea of the cost of bespoke waistcoats please? This is an outstanding piece and beautifully cut. The thing I love about this project is that it is truly both stylish and practical and will have a multiplicity of uses. It is not something that will give you buyer’s remorse. One can imagine wearing it with cords, jeans or indeed – as demonstrated – with trousers. Great stuff – bravo Simon. After having several shirts made by each of your preferred makers and making adjustments to each maker’s pattern to improve fit, do you find that any of the makers achieves a better fit than the others? I ask on this thread because the Abbarchi shirt pictured here seems a bit more loose fitting in the arms and shoulders than your other shirts made by Luca and D’Avino. I’ve not had a D’Avino shirt but Luca’s shirts, for me, were far better than Abbrachi’s shirts – both in terms of fit and make. The fit in the back is superb and the length just right. The lapel collar finish also flattering and effective. However it is too narrow across the shoulders. If it were only to be wrorn with a suit it would be correct but you mention dresswear (i.e. worn with a shirt but without a jacket) and for this purpose, traditionally, it is broader in cut. The shoulder arc should flow more vertically from the body line – this looks too ‘pinched’ across the horizontal and may (as there is no front-on aspect) highlight rather than alleviate the impression of shoulder slope. I am a client of Harris Tweed blazers for years, but was never able to buy a new one. I have some of them, second hand, from a Shopping Center in Bayswater and some shops in Portobello Road. Love this waistcoat. Just wondered if you managed to get a few prices confirmed of the various tailors? Hi Simon – I’m hoping to resurrect an old discussion here. I’m getting married in the summer and thinking about retiring my old dove grey backless waistcoat for something new to go under a morning coat. 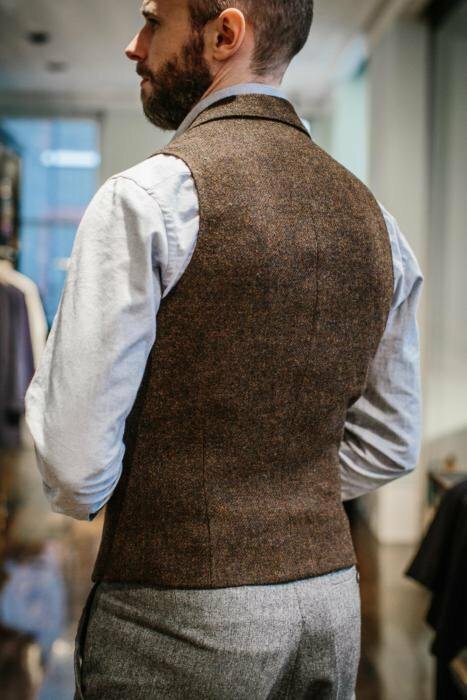 I note that your more recent posts on waistcoats have been rather single-breasted in contrast to your 2008ish waistcoat theory specifying DB as a preference… have your views changed? To complicate matters, I’d hope to have a waistcoat made that might be worn more casually rather than just reserved for the occasional wedding. What are your thoughts? Is it possible to wear a DB waistcoat casually? Although double-breasted waistcoats are beautiful things, I do think they look best under jackets – indeed under a morning coat, as yours will be. On their own, I would go with something more casual. Single breasted, perhaps self back as with my tweed one, and in a casual cloth such as a tweed or cotton. I’m not sure you can combine both of those needs I’m afraid. what fabric do you suggest to make an odd waistcoat for transitional periods? And what color/pattern do you think it is versatile enough?